If the lure of a high-end condominium or townhouse has peaked your interest but you are not ready to give up the privacy of your own home, then you owe it to yourself to visit The New Granada Park. Our Award Winning Single Family Detached ‘Town-Home-Style’ Residences feature Fortress construction, best-in-class Energy Efficiency, Fine Custom Craftsmanship, Rich Healthy Interior Finishes and intelligent Floor plans for the ultimate Turnkey In-Town Home Lifestyle . Living in Granada Park provides the ease of Lock & Leave – Maintenance Free Living, the Security of a Gate in an historic neighborhood with lush mature landscaping, paver driveways and crosswalks, and a large community pool with cabana. Granada Park is Coastal-Craftsman Contemporary Architecture set in a luxurious urban lifestyle. Nestled in the historic Granada neighborhood, between North Siesta and Oyster Bay, the new Granada Park has one of the highest Walkability Scores of any new neighborhood in Sarasota. You are within easy walking distance to grocery and liquor stores, the new Cinebistro movie theater at the Southgate Mall, several award winning restaurants, bookstores and banks, and is close to Siesta Key beaches, downtown Sarasota, Southside Village, Red Rock Park and The Field Club. Photos of Classic Collection architecture, interior finishes and details, and setting. Popular Upgrades include wide-plank hardwood flooring, premium porcelain tiles, gorgeous premium tile back-splashes, Wolf / SubZero Kitchen Appliances, Baldwin hardware, and luxurious 3cm Cambria quartz counter tops, and the big highlight of these homes (available on Most Plans, an additional 500+ square feet of Award-Winning, covered outdoor great-room tops this home off featuring a custom grilling kitchen with sink and refrigeration, large dining space, and lounge area with gas fireplace, and outdoor media connection. From Siesta Drive, turn South on Almeria Ave. Guest Entry Gate is located at the rotary at the south end of Almeria Ave. Drive in and make left on Pomegranate Place to find the Model. From Osprey Ave and Bay Road, Head South on Bay and make a quick right about 50 yards on the right hand side to the South Gate. Granada Park pays homage to time-honored design principles, while integrating today’s most popular home styles and features. Each plan custom designed to take advantage of its specific home site. Only 9 Home Sites Remaining! 2 ready for For Immediate Occupancy. Your Granada Park home is a true reflection of your individuality and personal style. 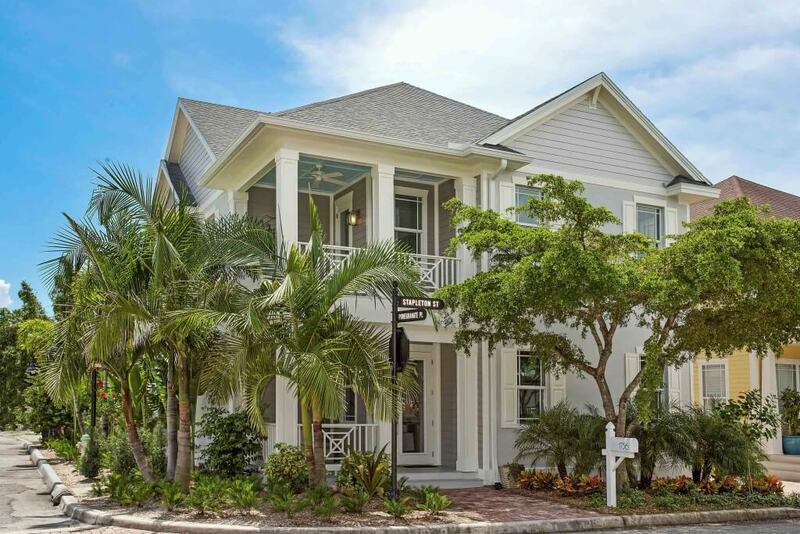 Constructed by renowned Sarasota builder, MGB Homes, each new residence beautifully blends traditional Florida architecture and the latest construction codes and innovations. Built with exquisite attention to detail, exceptional quality craftsmanship, superior materials, and unmatched energy efficiency, you’ll delight in classic homes with high ceilings, rich finishes, gourmet kitchens, indulgent baths, inviting porches and all of the new home luxuries that make your life at Granada Park truly enviable. If you are ready to take advantage of Florida’s carefree lifestyle and forget about the never-ending chores of home ownership, you will truly appreciate the convenience of Granada Park’s maintenance services. With just one low monthly fee, you’ll never again worry about lawn and tree care, irrigation, pool, sidewalk, road and gate maintenance. It has never been easier or more convenient to enjoy all that life in Sarasota has to offer.